While the official Bloor Street Transformation project was completed in October 2010 by the Bloor-Yorkville BIA, the vitality and growth of the area keeps moving forward! As of late, there’s been a number of much-anticipated store openings and re-launches, all of which add to the excitement and vibrancy of Bloor Street. Below are a few highlights of what’s new and what to look forward to. For all the minimalist-fashion enthusiasts! Canadian powerhouse Aritiza has made its mark in the design world, recently punctuating that success with the unveiling of their Bloor Street flagship. After a 6-month shutdown for construction, the store re-opened (fittingly on Valentine’s Day) double its original size, unveiling a 10,700 sq. ft fashion destination. Lending to its destination-feel is the curated lounge area accented with marble floors, lush greenery, art installations, and eclectic furnishings. The connected A-OK Cafe is a first of its kind concept for Aritzia, furthering its appeal as a social, fashion destination. Of course, the boutique itself is filled with many in-house brands that shoppers can’t find at other Aritiza locations, including The Group by Babaton, Le Fou Wildred, Sunday Best and Little Moon. Croissants and latte’s from A-OK mixed with high-quality wardrobe staples make the new flagship an iconic staple on the Bloor Street fashion block. While Birks didn’t shut down for their redesign, the unveiling of their transformation is nothing short of impressive. With the construction hoarding down, the corner of Bay and Bloor now houses the floor-to-ceiling glass flagship, brightening the entire block (with diamonds, of course). The completely modern concept is well aligned with the growth of Bloor Street, merging fashion with function. 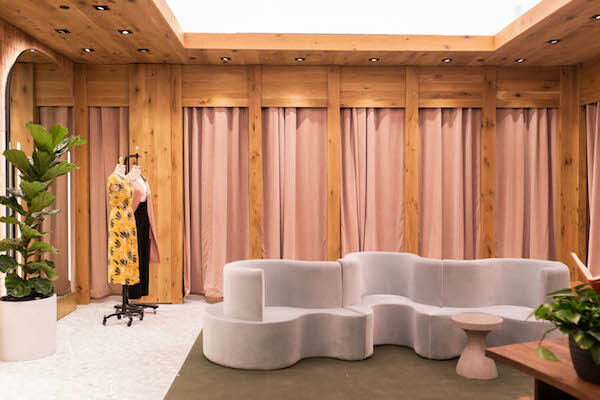 Inside the new store is a Bridal Bar, a Van Cleef & Arpels full-size boutique, and a unique Bloor Street Birks pop-up area fit for housing events and media installations. The space also features an open-concept lounge with an espresso bar and a library of art books, creating a social atmosphere conducive to spending time and exploring the culture behind the brands. Keeping with the ground-to-ceiling glass design is neighbouring Indigo, which has become a literary social destination in itself. With the hoarding now down on this remodel, the new storefront speaks to the bright and airy aesthetic of the Bay and Bloor corner. Much like the Aritzia and Maison Birks concepts, Indigo provides a space for lifestyle and literary shoppers to explore, socialize, and relax. With entire areas of the shop dedicated to everything from kitchen supplies, to living room decor and fashion accessories, there’s truly something for everyone to discover. Plus, a recently opened Starbucks just outside the shop allows for a classic Indigo and chill afternoon. The anticipation of Eataly at Manulife Centre has reached an all-time high. 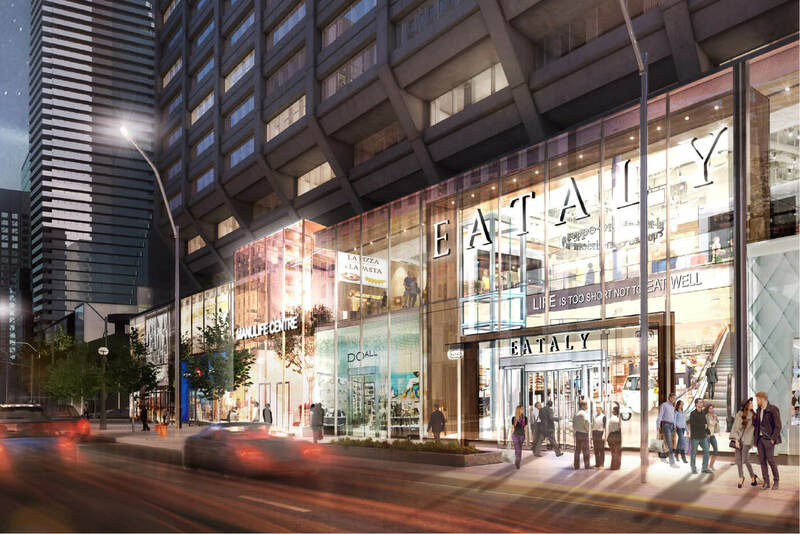 Slated to open before the end of the year, 55 Bloor Street West is set to house Canada’s first Eataly with a 50,000 sq. ft, three-floored space. Not only will the shop include multiple restaurants, but also numerous take-out vendors, and markets with fresh ingredients at the ready. Eataly has always maintained the concept of bringing the most sustainable and fresh ingredients to the forefront, making for an authentic and game-changing Italian dining experience. Without a doubt Eataly will soon be a destination of choice for the Bloor-Yorkville community, whether it be for a happy hour vino, lunch meeting, or planning a dinner party. Anyone who’s taken a stroll past The ROM lately has likely seen their hoarding which displays renderings of a beautiful new outdoor space. This exciting development will create a social atmosphere outside the museum, featuring 5,500 sq f of seating arrangements, green space, and an outdoor stage area for various performances. With summer on its way, we can’t wait to spend time in this new area while relaxing, socializing, or simply enjoying the culture within our community.Also on its way is a Christian Dior boutique at 131 Bloor Street West and over on Yorkville Avenue we’re anticipating the opening of Versace, Brunello Cuccinelli, River Island and Her Majesty’s Pleasure. There’s truly never a dull moment in Bloor-Yorkville and we can’t wait for what’s next!